Today I witnessed a very magical, once in a lifetime experience. I was walking along the totally deserted north end of the beach in San Pancho around 2pm and was suddenly aware of a noise. As I turned to look back I realized that I had just walked past a nesting Ridley Sea Turtle. She seemed huge! My awareness went many places at once. I didn’t want to scare or disturb her. 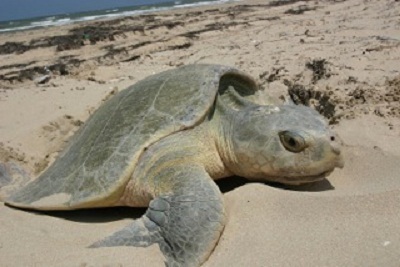 I wanted to immediately alert our turtle conservancy before any harm could come to the eggs and I wanted to get a photo! I took a quick photo from a good distance and put several items around her to protect her and since no one was around I ran down to a friends house to try to call “Turtle Frank”. My friend was not there and by the time I got back, which was not long, she had quickly finished her business and exited back into the Pacific Ocean. I didn’t know she could move so fast! It was a very steep part of the beach that she had climbed and she made it a quick exit. About that time three folks from Seattle walked out on the beach and offered to drive down to Franks while I stayed with the nest. I carefully delineated the site and short order Frank and volunteer Sofia from Hungary arrived. After some minutes of probing Frank found the eggs buried what seemed to me surprisingly deep. There were 110 of them! They are now safely in the nursery waiting to hatch with the rest of the recovered nests. I’m still in awe of the size, strength and perseverance of that old girl. My hats off to her! It’s one of the reasons I love it here along the Pacific coast of Mexico. The animal life is so amazingly rich. What a gift!